Have Your International Sales Gone Away? Recently, I participated in a discussion on a bookseller's forum in which somebody declared, "I ship EVERYTHING in a box," then later noted that his packaging cost alone was about a buck a book. A buck a book? This is far from the first time I've heard this sort of thing. The use of boxes by booksellers seems to persist, stubbornly, as though there was something sacred in it. Or that, once one graduates to using boxes exclusively, one has arrived as a bookseller. What a bunch of applesauce. If you sell several thousand books annually, say, isn't there something better one could do with those several thousand's? I'm not saying that shipping supplies shouldn't cost you anything, but in most cases they can be reduced to under a dime, sometimes down to a penny or two - and satisfy several other essentials in shipping: protect a book against damage and package it quickly, not to mention keep things as light as possible. Here's a question for you: Have your international sales tanked in recent years? If so, have postage increases been a factor? They have gotten borderline obscene. Early in my bookselling days I recall shipping books internationally in Flat-Rate Priority envelopes for something like $7.95. Now they are well north of thirty bucks. Even First Class International is no longer cheap, and Flat-Rate Priority boxes? Forget it. If that wasn't enough, consider what's happened to the USD/Euro exchange rate in recent years. In 2006 a dollar bought something over .6 Euros; today it buys, on average, over .9 - a 50% increase. Globally, the situation is similar. During this same time period the cost of using a USPS Priority Mail International Flat Rate envelope, for example, rose from $11.00 in 2006 to $32.95 today - an increase of over 300%. Add to this that fact that the US economy is significantly stronger than most European and other economies, and - pardon the cliché - we have a perfect storm for tanking international sales for US booksellers. Is there anything we can do about this? Individually, only one thing for now - adjust our shipping charges down. If this seems crazy given the above dramatic postage increases, consider that two important things can be done on the front end: We can reduce the cost of our shipping supplies and the weights of our packages. Which brings me back to boxes - or, rather, not boxes. Unless you have access to a free supply of boxes, or make your own from recycled cardboard - see Keith Moulton's how-to article here - boxes aren't cheap. And, add the associated costs of labels, tape, etc., and a buck a book could come into play. Some five or so years ago I suggested an alternative packaging method that, at the time, I had only used for a brief period of time. Having used it extensively since then with (to date) no issues whatsoever, it occurred to me that this might be a good time to reintroduce it. For me, in most cases, it's by far the best option for international shipping. 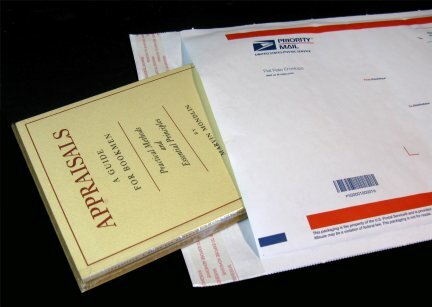 Essentially, this method consists of cutting a piece of (free) scrap cardboard slightly larger than the book, shrink wrapping it with the book (if it's a softcover, oriented with the fluting perpendicular to the book's spine), and stuffing the resulting unit into a self-sealing poly mailer or a (free) USPS bubble mailer. 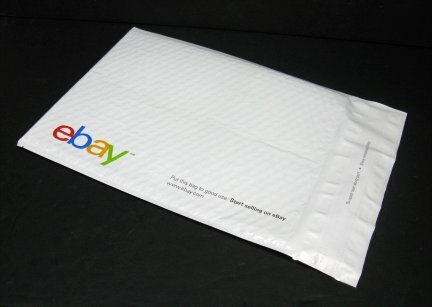 Or, now that eBay is providing free shipping supplies for Store owners, free eBay poly bubble mailers. The latter are large enough to accommodate most 8 ½" x 11" books. Assuming you use one of the free mailer options, the total cost of shipping supplies is about $.02 - and this for the cost of a thermal label and paper to print a packing slip. Moreover, for most softcover books, this adds about an ounce - at most two ounces - to the weight of the book, and think of this in terms of a book that might be close to the weight limit for First Class International shipping. Having to ship it Priority could more than double the cost of postage. And - is it fast? With practice, well under a minute for most books. 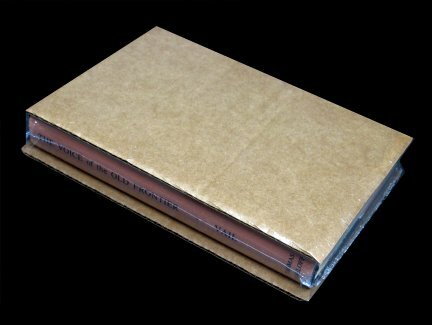 The shrink wrap and mailers I use are resistant to puncturing and tearing, not to mention sealed against moisture, but the biggest advantage obtained is the additional protection against damage created by the shrink wrapping process itself. Books sort of semi-magically become entirely different animals. They are not only frozen tightly in place but also transformed into a hard, wood-like block that cannot be deformed or otherwise damaged by anything but the most extreme handling. In the case of ephemera - documents, photos, etc. 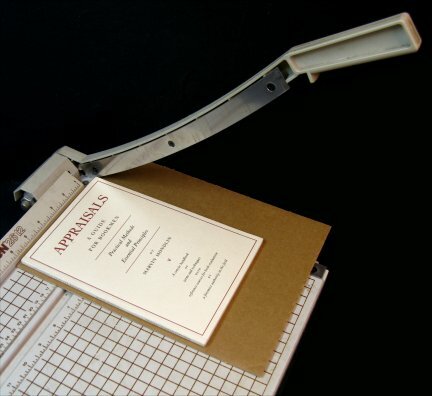 - or books with corners projecting over the text blocks (most hardcovers), it's a good idea to use two pieces of cardboard, creating a sandwich, and cross-orient the fluting for additional stiffness for ephemera. Shrink wrap can be purchased in rolls, tubes or bags, and obviously your greatest monetary savings will be realized with rolls, your greatest time savings with bags. Also, you will need two additional items - an impulse sealer to seal the shrink wrap before heating it and a heat gun. (Most blow driers are too slow.) Over-application of heat will cause the shrink wrap to fail, but very little practice is required to get a feel for how much to apply.